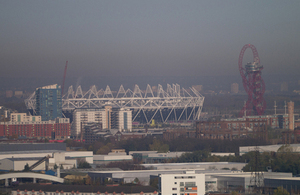 High levels of air pollution continue to be present in some parts of the UK today (4 April). Public Health England scientists are urging members of the public to consult detailed air quality maps on Defra’s website before planning strenuous outdoor activity. In the last few days a combination of local emissions, light winds, pollution from the continent and dust blown over from the Sahara caused a spike in the UK Air Quality Index compiled by the Department for Environment, Food and Rural Affairs (Defra). And those higher than usual levels of pollution may bring on health effects in some. PHE provides advice to Defra on the health effects of air pollution. While most people will not be affected by short term peaks in air pollution, some individuals, particularly vulnerable groups such as those with existing heart or lung conditions, may experience increased symptoms. On occasions where levels are high, adults and children with lung problems, and adults with heart problems, should reduce strenuous physical exertion, particularly outdoors, and particularly if they experience symptoms. People with asthma may find they need to use their reliever inhaler more often. Older people should also reduce physical exertion. Anyone experiencing discomfort such as sore eyes, cough or sore throat should consider reducing activity, particularly outdoors. Maps showing specific air pollution measurements are available from the Defra latest measurement summary and pollution forecast pages. Image by Shirokazan on Flickr, used under Creative Commons. 4 April 2014 New featured photo.